If you looking for Web tutorial for How to use FullCalendar.js plugin with PHP dynamic website for scheduling our meeting or event on particular date and time. 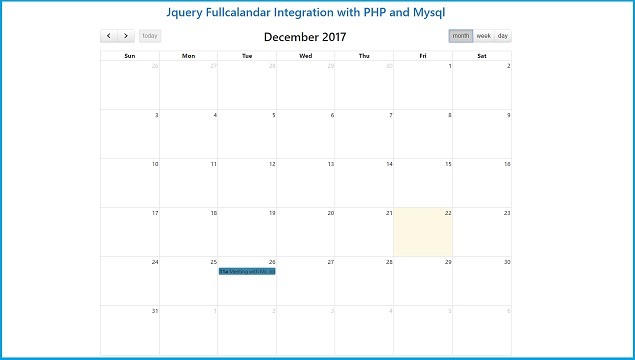 So in this post we have discuss How to Integrate Jquery FullCalendar Plugin with PHP server side script and Mysql database table. If you have working website for event management like schedule meeting or plan any task on particular date and that details we can see on web page in calendar format. For this things you can use this Fullcalender plugin is the better option than other. For discuss how to integrate this plugin with PHP and Mysql database, here we have make simple CRUD(Create, Read, Update, Delete) operation has been done with PHP Script with Mysql Data. First we have load data from database and display on calendar, so for this we have use events method. This method will called PHP page and from server it will send data in JSON string format and that data will display on calendar. Same way for add new event, so we have use select method of this plugin. By this method we can click on particular date cell then we can add new event of that day. After adding new event now we want to change date or time of particular event, so for this we have use eventResize and eventDrop method. By using this method we can change date and time of event. And lastly we want to remove particular event. So for this we have use eventClick method, by using this method when we have click on any event this it will triggered ajax request for remove event data from mysql table. So this way we can do Insert, Update, Delete and Select data operation with this Plugin by using PHP script with Mysql. Below we have also provide source code also. How to change color dynamically fc-content class. The code stops working when i wrote a script to apply css for current class? If I click a date then I click day button then i want that day's day view and similarly by clicking Week button I want to see that week's week view. Is there any method to do that? hi, your project is really cool. I followed your work. While i am inserting any event, its shows event updated successfully. but, in appearing on it.